Abu Dhabi—As weapons sales to Gulf countries soar, defense companies flocked to last month’s bi-annual International Defense Exhibition in Abu Dhabi. But amid the usual displays of machine guns, helicopters, and tanks, in the quieter corners of the showroom floor, purveyors of intelligence and surveillance products also hawked their wares to governments and law enforcement agencies worldwide. At one display, multiple companies banded together and debuted a one-stop shop for intelligence solutions branded “Intellexa.” Their booth displayed a massive “long range mission intelligence vehicle” sold by WiSpear, a company founded by former Israeli military intelligence official Tal Dilian registered in Southern Cyprus. Cyprus, according to documents leaked by former NSA contractor Edward Snowden, is a hub for British and American internet monitoring in the Middle East. The Middle East has long been home to autocratic governments seeking for ways to assure domestic stability. But what has changed, particularly after the wave of Arab Spring protests in 2011, is how they are seeking to prevent what they perceive to be threatening dissent. Countries like Saudi Arabia, the United Arab Emirates, Kuwait and others are buying up increasingly sophisticated computer equipment and expertise to help monitor and control the flow of information in their societies. “There’s a reason we’re all out here,” one U.S. industry source told Yahoo News. In the Gulf, the source said, companies can sell surveillance technology that might not be acceptable in other regions because of concerns over civil liberties. Yet in the case of Intellexa, it was not even clear which countries were behind the company. The official press release did not list Advanced Systems as a member company, but materials at the booth noted their involvement with Intellexa. The representative asked not to be identified because he was not authorized to speak with the press. “There’s very good interest among the intelligence agencies in the Middle East,” the representative said, adding that Europe and even the U.S. had also inquired about the technology. While Western governments often—though not always—use surveillance technology to monitor threats abroad, in the Middle East, the focus is typically internal. “These are societies that have embedded terror threats…and governments, especially in the Gulf, have a very low threshold for opposition before they feel it has to be stamped out,” said Jon Alterman, the director of the Middle East Program at the Center for Strategic and International Studies and a former State Department official during an interview. The companies typically don’t talk about the targets—just just the capabilities. 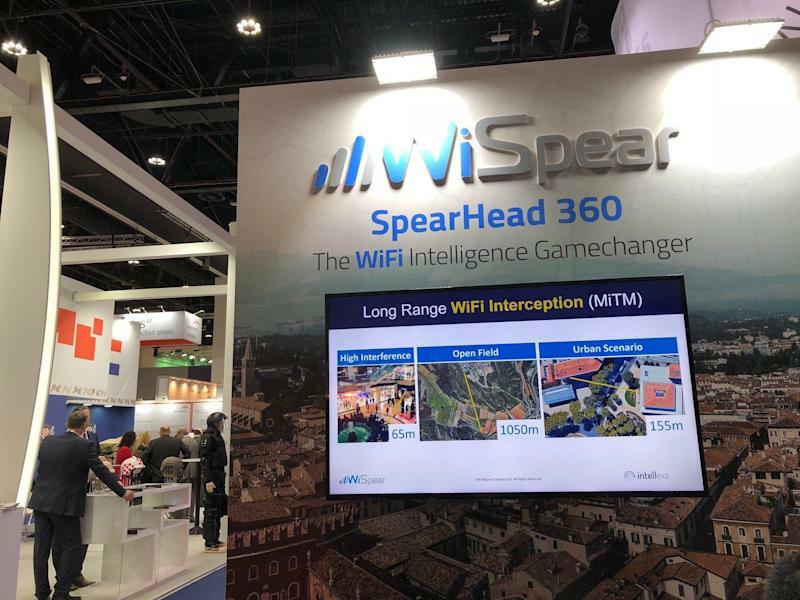 And Intellexa, according to materials available at the show, offers a wide range of capabilities from intercepting communications and target profiling services, to long-range WiFi hacking solutions and geotracking, and open source intelligence. 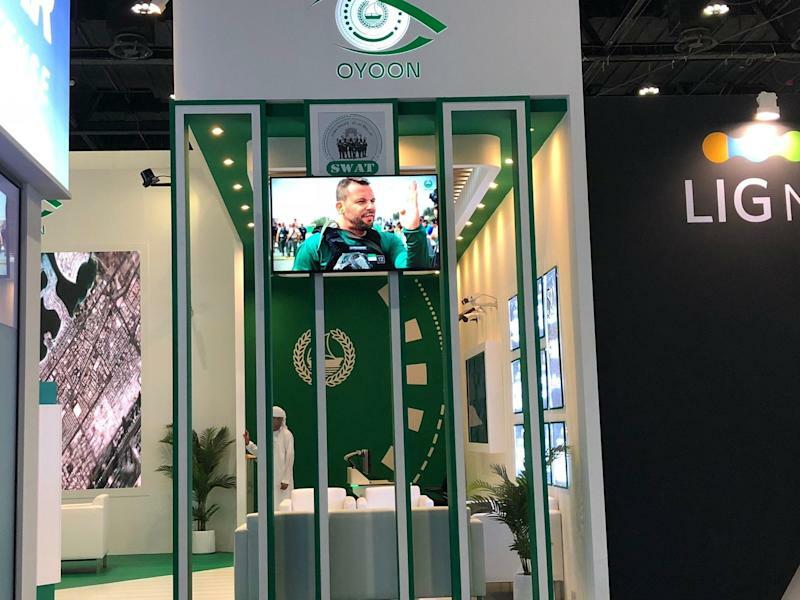 The surveillance vehicle on display revealed displays of phones and the WiFi each was connected to, and whether or not the network was locked with a password. Within 200-300 meters, the user can “infect” the target phone, the representative told Yahoo News. The consortium was offering monitoring products that can be attached to drones, or carried in a backpack. Advanced Systems’ “unified intelligence system”—which creates a dossier on each target mapping out their location, phone calls, social media, and more—is called “Cerebro,” reminiscent of a fictional device in X-Men where powerful telepaths can use their abilities to find anyone, anywhere in the world. The idea of Gulf countries buying drones that can hack your cell phone may sound shocking, but to Chris Rock, a security researcher currently acting CEO of SIEMonster, a monitoring software company, says none of this is surprising. Those jobs, he says, range from investigating a possible business deal to “surveilling their own people.” Gulf leaders have been known at times to send text messages to their entire population at once, he told Yahoo News. “What they wanted over there, we wouldn’t consider legal,” he said. What government in the region often want is to have the means to monitor all internal communication. In one case for example, Kuwaiti officials in the fall of 2014 met with multiple U.S. companies and consultants in the Washington, DC area to discuss ways they could monitor social media, such as Facebook and Twitter, for negative comments about the monarchy, according to an independent consultant present at the meeting. 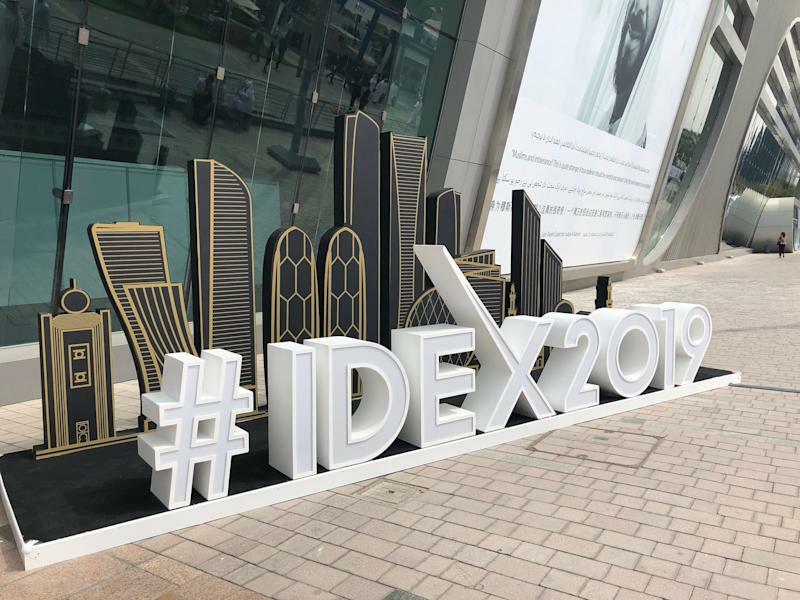 At IDEX this year, companies and government agencies displayed a number of surveillance technologies are already in use. 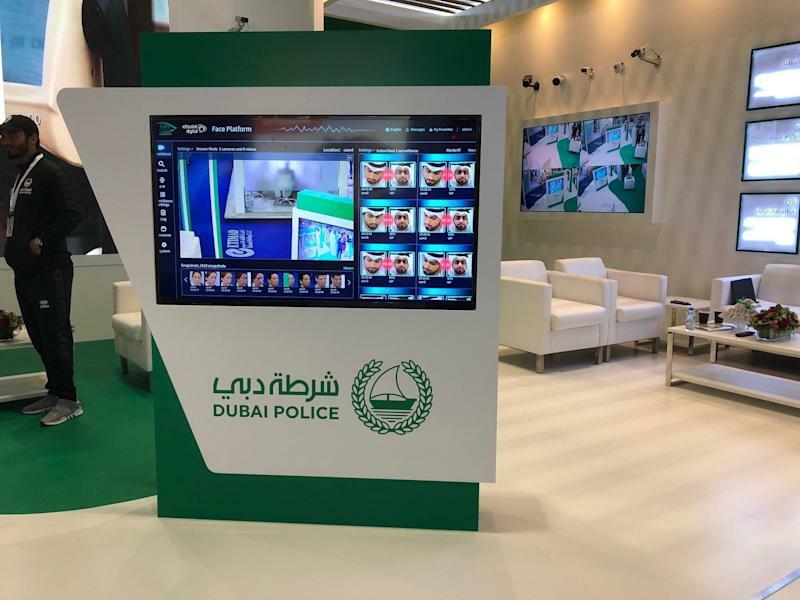 The bright green and black booth hosted by the Dubai Police, crowded with large military vehicles, included an active facial recognition display, showing example photos of Emirati men in robes—as well as a live stream of photos of faces passing by the booth. 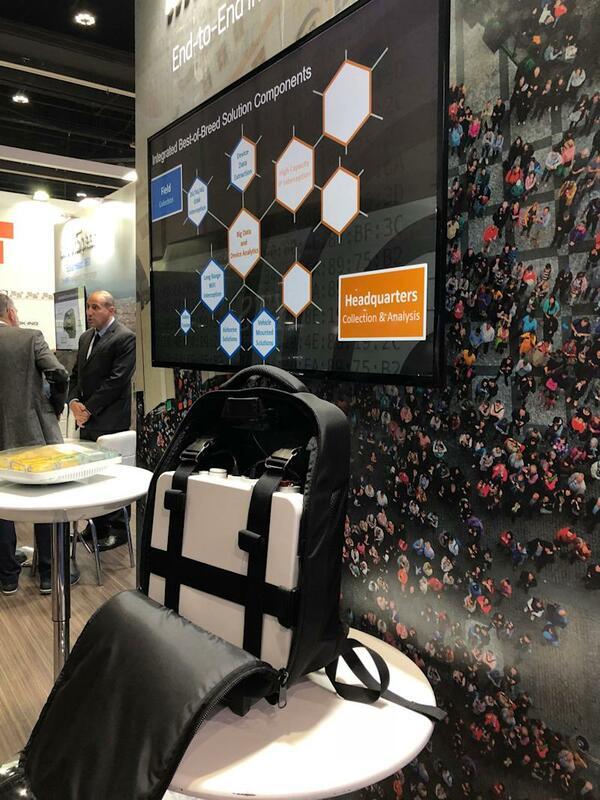 The UAE Telecommunications Regulatory Authority also had a booth where it was showing off its “spectrum monitoring solutions,” used to ensure reliability of mobile communication but can also be used for intelligence gathering. While the Gulf counties have long turned to Western countries, including the United States, the United Kingdom, and Canada, for intelligence services and technology, influence from China and others is beginning to creep in. “A lot of the current surveillance technology is being pioneered in Israel and China; and it’s targeted at counterterrorism; and it may be applied to a bigger definition of counterterrorism than Americans are comfortable with,” said Alterman of CSIS. Kara Frederick, an associate fellow at the Center for a New American Security who is currently studying the export of Chinese surveillance tools abroad, argues for controlling the spread of what she calls “digitally-enabled authoritarianism” to the Gulf. Yet the UAE is also focused on developing its own indigenous capabilities. For example, DarkMatter, a government-owned UAE cybersecurity company, has engaged in offensive hacking and surveillance both domestically and overseas. The company, which has recruited Westerners, including former National Security Agency employees, is currently under investigation by the FBI. Facing increasing legal and press scrutiny in the United States, DarkMatter may soon shut down in its current form, according to two sources directly familiar with matter working in security and industry. The security services it provides to the Emirati government will likely transition into new companies or entities under separate names. Intelligence gathering and targeting in the Middle East may also be growing harder to keep track of, says Bill Marczak, a senior research fellow at Citizen Lab who has tracked spyware and surveillance in the region for many years. Bruce Riedel, the director of the Brookings Institute’s Intelligence Project and a former long-serving CIA official, in an email to Yahoo News, says the Gulf countries focus on social media is not surprising. “The Saudis and Emiratis are emulating the Chinese path to create police states that control all social media via high tech surveillance,” he wrote in an email.